It is with great regret that I report the death, from cancer, of Captain Jeremy E. Carrad, Royal Artillery. He lead a varied life. Born in 1932, he grew up first in Sutton Coldfield and then in London. After enjoying his national service, he stayed on in the army for another 10 years, setting up a forces' radio network and making programmes for the troops. He joined the A.A.J.L.R. in 1959 as 2i/c 'A' Company and stayed until 1962 when he left the Army. While there he also found time to organise the Choir, produce and act in plays with the 'Tonfanau Players', record a group of boys called 'The Dreamers' and assist in the making of a War Office film called 'Follow My Lead'. From 1962 to 1976 he was anchor of the BBC West news programme, 'Points West'. From 1966 to 1969 he was also a presenter on the television series 'Tom Tom'. In the final episode of which Jeremy was blindfolded for a magic trick. He was placed into a free standing cubicle with black curtains and moments later the curtains were drawn back and lo and behold, no Jeremy. The credits then rolled. This may have been the end of 'Tom Tom' but was definitely not the end of Jeremy. In 1976 having decided that he had had enough of television he quit and moved with his wife and two children from Bristol to Weston-in-Gordano, near Portishead to run communications courses for industry. But the stage was still in his blood and he continued as a playwright and novelist writing 'The End Of The Pier Show' and 'Running On Empty'. He also sang with the St. Peter and St. Paul Church choir, run by his pianist wife of 50 years, Jean. Our thoughts are with Jean and his family at this sad time. 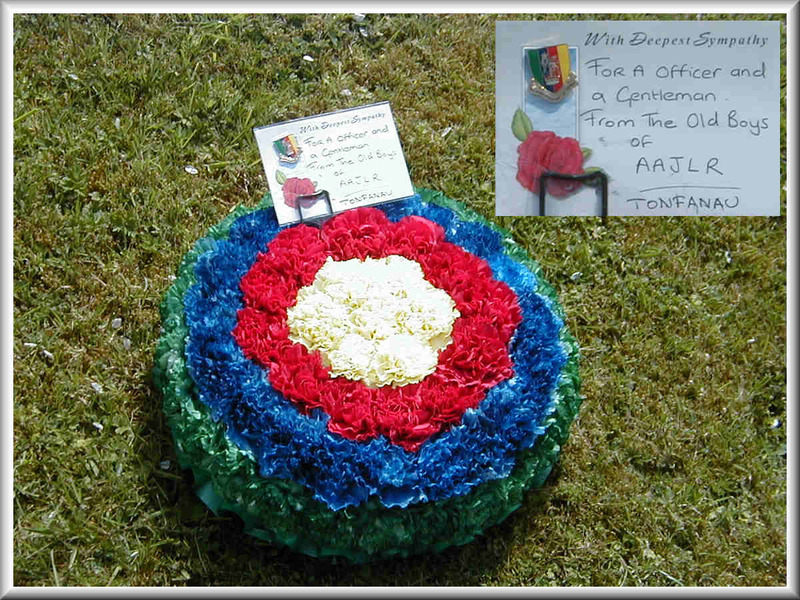 The wreath taken to the funeral by David Scott on behalf of all ex-members of the AAJLR.